For enthusiasts, rockabilly isn't just a kind of music; it's a way of life. A raw fusion of rhythm and blues with country and western, rockabilly heralded the start of teenage rebellion in America in the early 1950s. The stripped-down sound witnessed a revival in the 1970s that has continued until today, with modern rockabillies embracing not only the music, but also the clothes, cars and lifestyle of the 1950s youth counterculture. 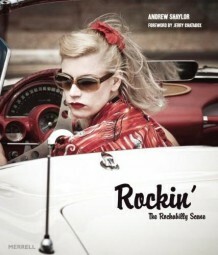 This book is photographer Andrew Shaylor's unique portrayal of the contemporary rockabilly scene. Granted exclusive access at events on both sides of the Atlantic, Shaylor captures the raw energy of the music and the commitment of the rockabilly community to authenticity. Featuring the history of the subculture by rockabilly legend Jerry Chatabox, this striking book evokes the passion and intensity of a scene that is as exciting today as it was more than 50 years ago. A plenty of stunning images capture the bands, dancing, fashion and cars that define the rockabilly subculture. With a specially commissioned foreword by Jerry Chatabox, stalwart of the contemporary rockabilly scene.